Love the jacket. You always seem to pull off so many different looks. A random question, is your grey miu miu bag the regular size or the mini size? It just seemed to me that the pink one looks so much bigger than the grey. That jacket is amazing. Love the color. and it fits so well. @Mania - heehee thank you :) trying to maintain the brows! I love the everything about your jacket, especially the color. Beautiful! It sort of reminds me of your new miu miu purse. 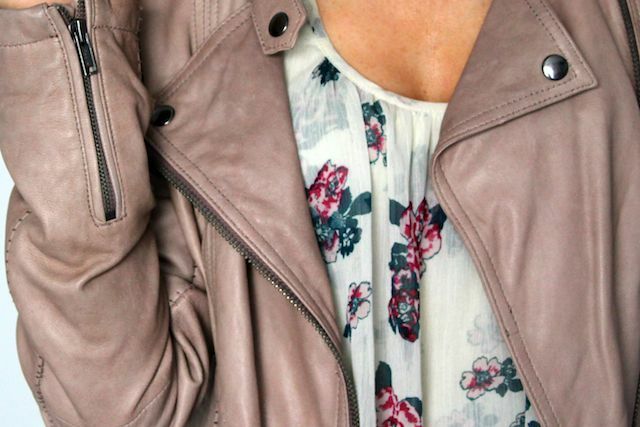 That jacket is gorgeouss, I don't think a blush leather jacket would fit very well into my wardrobe but you wear it very well with that top (which I am also loving, and your bag for that matter). I'm also on the hunt for new jeans, such a nightmare. I stumbled across my current ones by accident, I think they were more high wasited than they should have been and I cannot find that perfect waist height again! I love having my hair up for a change from day to day hair! Yehey !! I love your whole outfit, the look on your face, the makeup and the hair do !!! total package a winner !!! Also,I'm happy to say that I own a similar color of the rider's jacket you have right now:) I also want them in red and black !! It is so in this fall. I love the jacket, the color is unique and pretty! 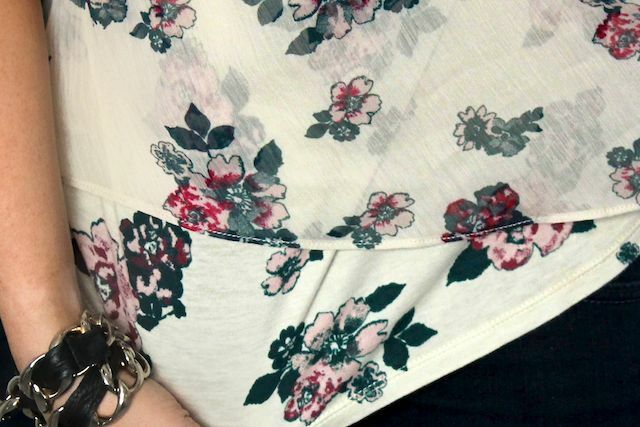 Do you have a link to the UO top? Your jacket and outfit is so casually glam, love it! That hair style is also so cute! I wil be trying it tomorrow. This is random but its good to see your head again!! @claralarala - yes i think you have :) haha scroll past the four pictures, the paragraph of text and it's there. You look lovely here Laura as per :) This jacket is gorgeous!!! I bought the illuminating fluid in duty free the other day - still confused as to how to use it. How do you do about slapping it on?! Love the jacket! Really like the outfit. For once I've looked at a jacket without thinking "that would look better in black". I love the colour and the style of it!! What a gorrrrrrrrrrrgeous jacket! Serious envy right now! I spy a similar colour to one's gorgeous bag too..! The jacket is gorgeous but I've an inkling that top will be mine! Wowww I'm in love with this jacket, what a stunning colour! I have this jacket and in addition to the colour i find that the leather is amazingly soft as butter and the jacket itself if feather light. In fact wen thenparcel arrived I thought before the opening that there must be a mistake since no leather jacket could bpe this light. More like a soft cardigan than a leather jacket. but a bit confused how to use it, do you mix with your foundation or use it as a highlighter or..? Also I warn you, I have been looking for the perfect skinny jeans and it has been so difficult, in and out of changing rooms pulling on one after the other! The jacket is gorgeous. Love the colour, it looks great on you! Love this jacket, it looks so soft and a great colour. Looks like it was made for you! I love that hairstyle! I'll definitely give it a try the next time I'm stuck in a ponytail rut. Is Brash discontinued? I couldn't find it on the MAC site and a Google search turned up a lot of different colored shadows. Is it a coppery color? I love the jacket! Nice color! Thanks again for sharing Laura! I'm so happy! Love the outfit and the handbag...FAB!! You should check out the denim brand DL1961. They are extremely high quality and will fit basically every body type. I ordered mine online without even trying them on (in my normal size) and they are the best fitting jeans I have ever had! (I already bought another pair!) I don't know if they ship to the UK, but bought mine at shopbop . com. I LOVEEEEEEEEE this look!!! It looks so sweet, simple and pretty!!!! Is it rude to ask how much the jacket was? So glad to read your blogging again, I've missed it! the bag really looks like a Alexander Wang rip-off. Would the focco fit a 15 in macbook pro? That jacket is absolutely gorgeous, as are you! Do you model? I love your outfit! Amazing jacket! you have a wonderful smile! absolutely love this jacket, since seeing these pics i have not rested in my search for the perfect leather jacket for fall.